Mildred Jeanne Tate Simpson was born on December 3, 1926 in Plainfield, New Jersey to Clarence and Katherine (Bullock) Tate. Tutty, as she was affectionately known growing up, spent her early years in Metuchen. She graduated from Metuchen High School, Class of 1944. Following graduation, she pursued a secretarial career starting with formal training in New York City. Jeanne was introduced to her husband-to-be by mechanic Herman Folkes, who later married her cousin Doris. Herman had come to Metuchen to pick up Doris’ vehicle for repairs and brought John Simpson with him to drive his vehicle back to the auto body shop. Jeanne was married to John on October 5, 1955. The newlyweds lived with John’s sister Alberta and her husband Eddie on 7th Street in Newark. Shortly thereafter, they found an apartment of their own in East Orange. To this union were born three children, Stephen, Gloria (Jill) and Holly. Jeanne spent a brief time as a secretary at the East Orange Police Department before going to work for the City of Newark for 10+ years. 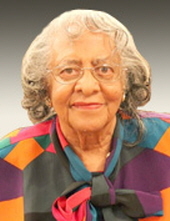 She was a devoted member of Mayor Sharpe James’ administrative team as an Executive Secretary. During her time with the City, she formed lifelong friends and ignited her passion for travel. Taking advantage of annual trips sponsored by City and the Metropolitan Museum, Jeanne traveled to Israel, Russia, France, Senegal and many countries in the Caribbean. As the granddaughter of Reverend Nelson B. Tate, founding pastor of Second Baptist Church of Metuchen, the church was always an important part of her life. Jeanne was one of the original members of New Hope Baptist Church of East Orange, serving on the Ways and Means Committee, editor of the church newsletter and the first chairwoman of New Hope Women’s Day. After leaving New Hope, she joined Imani Baptist Church of East Orange where she remained a member until her passing. During her time at Imani, she was the secretary and a chaplain of Wisdom’s Children, writer for The Trumpet a Flower Girl, member of the Hospitality Committee and African American Heritage Group. She also worked tirelessly with the clothes closet to support the less fortunate. Anyone who knew Jeanne, knows how much she loved her family. Her grandchildren were her pride and joy. When she wasn’t balancing her active social calendar, Jeanne was writing letters, sending cards or making calls just to say hello. Jeanne peacefully departed this life on Sunday, January 20, 2019 at Gilchrist Center in Baltimore. She was predeceased by her husband John; son Stephen; sister Marguerite Wareham; cousin Doris (Herman) Folks, and cousin Nelson (Charlotte) Tate. She leaves to mourn her passing, her daughters: Gloria Jill Duvall (Derrick) and Holly Simpson; grandchildren: Shannon Jones and her husband Justin, Justin Owens and his wife Princess, and Sydney Rachaman; great-grandsons: Noah, Jordan and Canaan Owens; cousin Dorothy Lassiter, along with her sisters-in-law, cousins, nieces, nephews, church family and a host of friends. To send flowers or a remembrance gift to the family of Jeanne Tate Simpson, please visit our Tribute Store. Imani Baptist Church of Christ, Inc.
"Email Address" would like to share the life celebration of Jeanne Tate Simpson. Click on the "link" to go to share a favorite memory or leave a condolence message for the family.